While the temperatures outside my house are at a -50 wind chill, it’s hard to think warm thoughts. One thing that does warm my heart though is the thought of Valentine’s Day. I’m not the type to want a bouquet of flowers and chocolates. Actually, I’m far from it. I’d rather save my Valentine’s dinner for a day or two after the 14th to avoid busy restaurants; it’s the company that counts, right? Not the day. If your spouse is working on a goal towards fitness, this may be the perfect time to show how much you support them in their goals. I can honestly say I wouldn’t be where I’m at health and fitness wise right now without some pretty special people supporting me along the way. 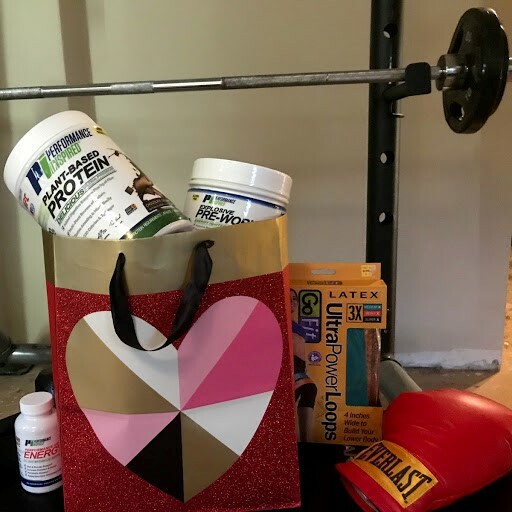 If your spouse is serious about fitness (and isn’t easily offended; believe me, I’ve heard horror stories), I’d definitely consider a few gifts to give them that can go far in them attaining their goals. One cute gift that isn’t expensive, but that I have noticed makes a world of difference, is a quality water bottle. I absolutely love my bright pink Bubba water bottle. It’s big and the straw is larger and more flexible which encourages me to drink more water throughout the day. I don’t go anywhere without it. It’s always on the road with me as well and I drink water at red lights and make sure that after my body is put through a tough workout, hydration is key. You can usually find a quality water bottle at most stores, but you’ll want to get one that’s easy to use, handle, and travel with. They’ll run you anywhere from about $10.00 on up. You can always do a Performance Inspired gift basket as well. Order a tub of PI’s great variety of protein, some awesome supplements like CLA, Performance Diet and Energy, and Multivitamins. You want to make it a little sweeter? Add some delicious protein cookies and bars in there to support their protein intake and add some not-so-cheat sweets in the basket. Two other options that are little more expensive, but very much worth is are home gym equipment or some sample gym personal training sessions. If your significant other works out at home, a great gift would be some resistance bands, a jump rope, and dumbbells. If you want to go a little more expensive when it comes to at-home equipment, an elliptical or treadmill would be great (and you can both use it!). If they already love the gym, why not bump up their gains and purchase a few personal training sessions for them. Personal training changed my life and I know for a fact that it can help others. I’ve seen in work not just for me, but for some many other individuals of all ages and sizes. Maybe ask your gym if they offer a free “test drive” on a training session and then go from there. Maybe do half hour sessions to reduce the cost, but the hour is well worth the money. Last, but not least, wireless headphones. There is a rarely a time when I work out, cardio or strength, without my Beats on. They are definitely a game changer. I like my music loud. It helps me get in the zone and when someone sees you with your headphones on, they are less likely to interrupt your session. There are so many options out there such as on the ear, over the ear (my fave! ), and in ear; however, you’ll have to look into their preference or save the receipt. I’m one of those that in-ear headphones just don’t fit right.